An absolutely beautiful day here in Northern California. We are having wonderful walks in the dark with the stars twinkling over head. The leaves are turning golden yellow. Tonight is Saturday Soup, our new name for the menu. Up tonight is a split pea with cheesy croutons on top. But it’s going to change by Friday when we’re in for rain and cooler temperatures. Right now our days have been in the low 80’s and high 70’s. By Saturday, it’s going to be in the high 50’s. Very cool. And even snow in the higher elevations. But today is lovely. My sister and family are going to Nevada City today. I’m going to drive and then we’ll walk around this charming Sierra foothill town. I think we’ll do lunch at a place I’ve wanted to try called Three Forks. It’s a bakery /restaurant. There’s also the Nevada City winery and we’ll pop in there. Then home and we’re all going out to dinner tonight. Tomorrow they leave, and I go to get my flu shot. Thursday I see my doctor. B is taking me as my brother is still using my van ( week 4). He says it’s burning oil and I said it hadn’t been but you’re driving it over 80 miles a day for the last 4 weeks. If it is, then I may just go ahead and sell it. I don’t really want to put any money into it. But I only have driven it maybe 20 miles a week, to go to town so this is quite different. Hopefully , it’s only because he’s using it so much but I guess we’ll see. It does have 150,000 mileson it so we’ve gotten our moneys worth. On another note, the refi is on and we should be able to finish up very soon. Yes!!!! What a long drawn out process. But the bottom line is for now this will make a big difference in the payment. Of course, I wish we didn’t have a mortgage as we go into retirement but , it is what it is. Fall has arrived in Northern California. Beautiful days and cool nights. The forecast is much of the same for the next 2 weeks. When my sister arrives with her 3 daughters, the weather will be cooler. 75 degrees during the day and cooler at night. I’ve already planned a tentative itinerary and meal plan. One of the days they want to drive up to Lake Tahoe. I may or may not go. It’s a pretty straight forward drive but if you want to go around the whole lake, pretty long. So, then we will do a wine tasting and lunch. It’s a nice winery and pretty. Of, course, this time, they’re at a hotel( thank you). But still, it will be a little stressful to deal with them all. We have another tree to deal with asap. We have very large Ponderosa pines on our hill here and 2 years ago bark beetles came thru and we now have a stand of dead trees. But they are all down hill and not a threat. Just ugly. and a potential fire threat. But also, way too expensive to take down. So, there is a tree below our pool that has looked a little stressed but not bad. Overnight, it turn brown. I kid you not one day, sort some brownish pine needles, bam ,the next day brown. So, We have to take it down. It’s a very large tree that , if it fell would cause some damage. so we just , and I mean just got our EF back up and now there goes the money… cha ching, cha ching. It is so frustrating. The tree needs to be brought down while someone can still climb it and if we wait that won’t happen. So, hopefully we can get a bid this week. It’s also tree cutters busy season, so there could be a wait. Ugh!! Other than that not much new. It’s kinda weird not being on any treatment but also quite lovely. I go get my labs next Monday so I should know before our Florida trip how the numbers are. B got the bathroom painted. Looks great and now he will work on the front room. I’m keeping the same color,Navajo white, which is a soft cream white. It works well in that room. He might get started next weekend. I’m going to paint one wall in the bedroom , simply white ( Benjamin Moore) to see how I like it. WE are still waiting on the refi, because of the subordination, but it should be in soon and then the final whatever. We were offered a one time recast of the loan as per the HAMP program requires but the payment is still a lot higher than this loan we have going. It’s tempting but we need the lower payment in order to make this affordable. I’m hoping that right before B retires we can refi again for an even lower rate. Plus, we will need our ducks in a row, with no car payment. Since he has to have the car for work we will need to time that. We’re thinking of him getting another Elantra for the mileage. We’ll see. Dinner is potato leek soup and grilled chicken. maybe a salad. Our weather has definitely changed to fall weather. Much cooler and our oaks are turning their yellow colors. Things are back to normal after my sister left on Sunday. We moved out the extra bed and now I’ve moved one of those arts and crafts style chairs out there. It’s nice and a good use of space. This is the room where my daughter had her bed etc. this summer it was our remodel and that’s when after we took the skylight out we knew we needed a roof. So, one thing lead to another. I still have miscellanous hanging around but shall get to it. Today was doctor appt day. Just as I thought he said lets do another cycle of pomalyst. He said , and I agree, we need to hold off as long as possible to use another drug. So all in all, my numbers did go down. Not a lot but still down. I need to get another blood test Monday to make sure my neutrophils are up and then get the Pom delivered. So I won’t even start till next week. Next month I’ll get the zometa infusion since its been 6 months. Then B and I went to Mexican lunch and then home. Tomorrow I was suppose to take a friend for surgery, but it was cancelled. I’m going to go do some errands and then the Applegate coffee klatch. My sinuses are bothering me with the fall cooler temperatures and so I’m not feeling great. This happens every year like clock work. Fall, cooler weather, sinus issues. Im going to crunch budget numbers tomorrow too. We just paid our annual house insurance and our last big bill is property taxes. We walked again, almost 3 miles. Nice. It is a dex day for me so for those of you who don’t know what decadron does. It’s a steroid that helps with the chemo, but it causes some unpleasant side effects. I take it at bed so I get thru the night( the first 8 hours) asleep. Well sort of since I never sleep straight thru. But the next day you have a lot of energy for part of the day. Then you sort of just run out of steam and crash…. I lay down for maybe 3 hours and then by 4pm I start to feel alright. Tonight then I will take Ativan to sleep otherwise you’d lay there all night. Tomorrow is better and so forth , then it starts all over. It’s once a week . So, that’s my life. I do get a lot of batch cooking done and some Flylady stuff. Usually I finish the zone in an hour . 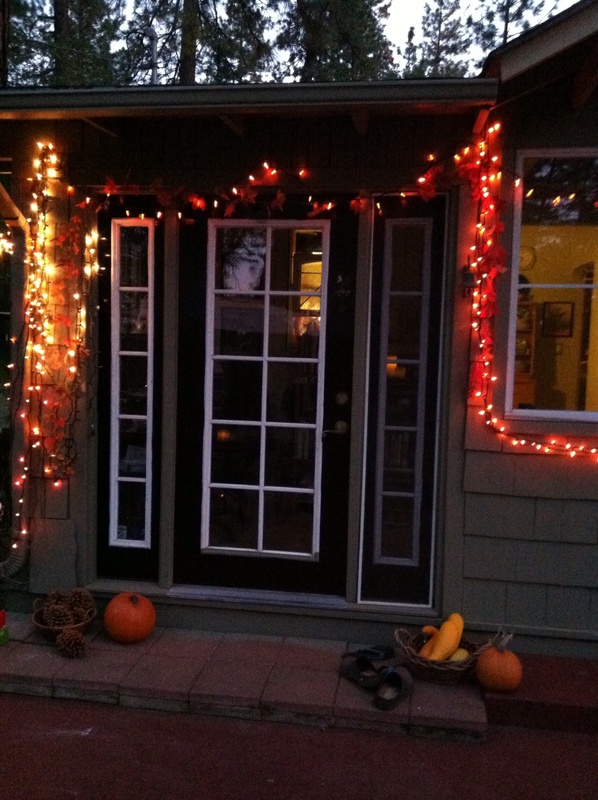 Well, here’s our fall lights outside. 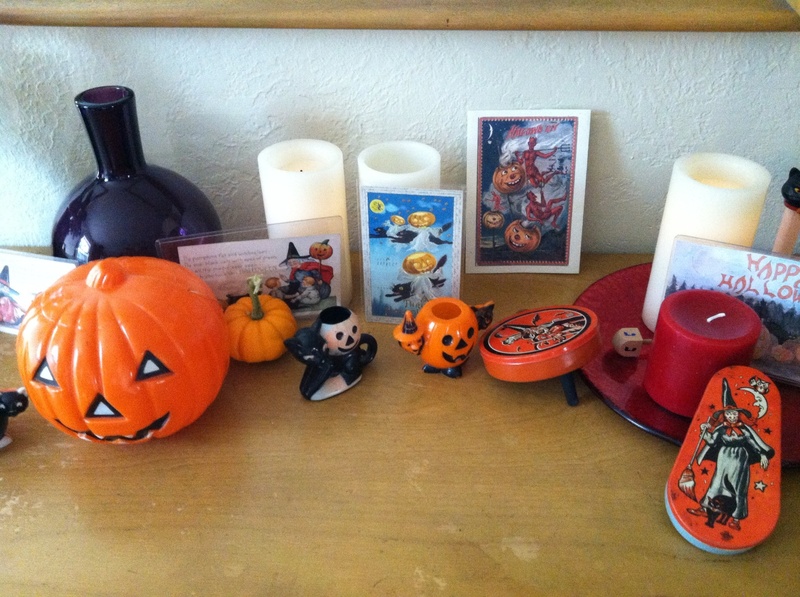 I put out my vintage Halloween collection. One of the few things I haven’t gotten rid of ,because I love them. Went for a walk with B at 6:45. I like the early morning. Today the library is closed so we headed for Costco. Got there right a 9:20. Spent a lot but I made a dent in Christmas/hanukkha stuff. Yes, we are non religious, but I like both celebrations. So, we do them as celebrations of the gift of light and the winter solsiste. Works for us.